The story of Desmond T. Doss (Garfield) is one of those stories that seems tailor made for a big screen adaptation. After a childhood incident where he nearly kills his older brother, Desmond takes the sixth commandment, thou shalt not kill, very much to heart. When the US enters the Second World War, and pretty much every other young man has enlisted, Desmond enlists as well, and is sent to Fort Jackson in South Carolina for his basic training, he immediately upsets the normal order of things by refusing to touch a rifle… or indeed, any weapon. Naturally this antagonises his fellow trainees, and they make life difficult for him, as does his instructor, Sergeant Howell (Vaughn), and commanding officer, Captain Glover (Worthington), who want to see the back of Doss and his religious beliefs (he’s also a Seventh Day Adventist). But Doss endures everything the army can throw at him, and begins to earn the respect of his comrades. However, when he’s given a direct order to pick up a gun and he refuses, he finds himself facing a court-martial. Luckily, a last-minute intervention by his father (Weaving), sees Doss allowed to take part in the war as a medic and without having to carry a rifle. Soon, Glover’s men, including Doss, are shipped out to the Pacific, and specifically, the island of Okinawa, where they are tasked with climbing the cliff face of the Maeda Escarpment – otherwise known as Hacksaw Ridge – and take on the Japanese forces that are dug in there. Their first attack is unsuccessful and they’re forced to take shelter on the ridge overnight. The next day they’re driven back down the Escarpment, leaving dozens of injured and wounded men behind. Doss, however, refuses to leave them there. Over the next twenty-four hours he rescues seventy-five men, keeping them safe from Japanese patrols and when it’s safe to do so, lowering them down the cliff face to the amazement of the US soldiers below. Doss’ last rescue saves the life of Sergeant Howell, and he and an equally chastened Captain Glover, admit how wrong they’ve been about Doss and the courage he’s shown in sticking to his beliefs, and in saving so many men. The next day, another assault is launched. This time it’s Doss who is injured, and this time it’s his fellow soldiers who have to take care of him. Doss’s heroism – and rescue of so many men – is told in a straightforward, linear fashion (its prologue aside), and is respectful of the man and his beliefs to such a degree that there’s a danger of his being a symbol rather than a fully fledged character. 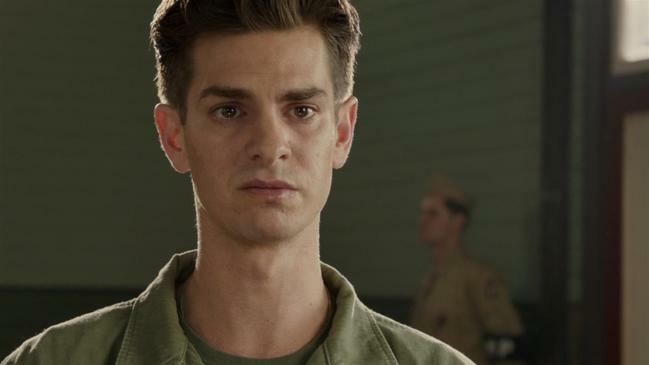 But thanks to a combination of Robert Schenkkan and Andrew Knight’s moving screenplay, Andrew Garfield’s impressive performance as Doss, and Mel Gibson’s equally impressive directing turn, Hacksaw Ridge never lionises Doss to the extent where he’s portrayed as an above average human being doing something extraordinary. Instead, Doss’s humility and keen sense of purpose keep him grounded firmly and effectively, and his sincerity is never doubted. He’s exactly the kind of man you want fighting alongside you in battle. Garfield – on somewhat of a religious roll with this and Silence (2016) – expresses Doss’s beliefs with a keen sense of how important his faith is to him, and gives a performance that is subtly nuanced, honest, and hugely sympathetic. When he’s saying to God, “Help me to get one more”, there’s no other line of dialogue in the movie that so perfectly encapsulates Doss’s character and personality, or his sense of personal responsibility. Garfield is helped and surrounded by a terrific supporting cast, from Weaving as Doss’s sad, alcoholic father, to Palmer’s girl-next-door who he falls in love with at first glance, and on to Bracey’s gung-ho soldier who accuses Doss of cowardice. Vaughn, who rarely strays from his comedy man-child persona, here does some of his best work in years as the gruff Sergeant Howell, berating his men in a toned-down version of R. Lee Ermey’s Sergeant Hartman in Full Metal Jacket (1987), and doing so with a thinly disguised layer of affection. On the home front, Palmer is suitably fresh and enticing as the love of Doss’s life, and Griffiths is appropriately supportive as his mother. Only Worthington, saddled with a stock character and some clumsy dialogue, fails to make an immediate impression (though once he’s on Doss’s side it’s easier for the viewer to be on his side too). But overall, this is Gibson’s triumph through and through, a powerful, riveting war movie that features some of the most exhilarating and, at the same time, exhausting battle sequences since Saving Private Ryan (1998). But where Spielberg’s ground-breaking recreation of the Normandy landings was brutal and uncompromising, and featured someone – Tom Hanks’ Captain Miller – that the viewer could relate to during all the carnage, here Gibson switches perspectives between the US and Japanese soldiers almost at will, and in doing so, captures some of the true, overwhelming nature of hand-to-hand combat (while also seeming a little too pre-occupied with setting men on fire, images of which crop up time and again). 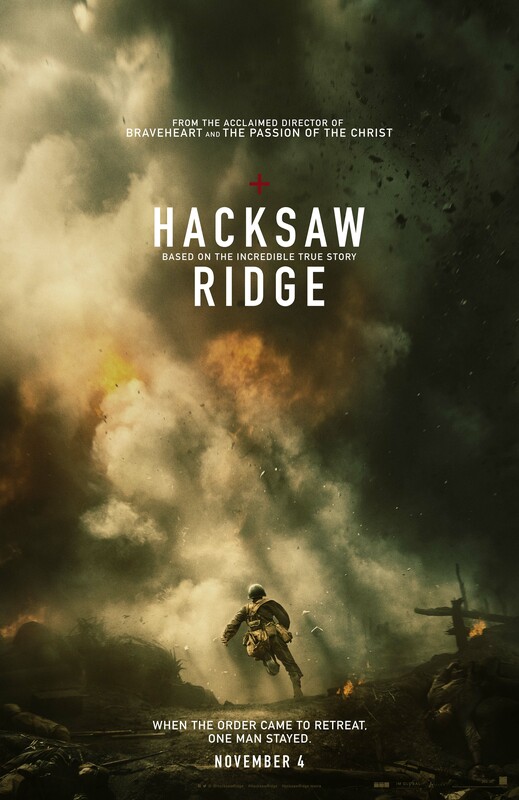 But while the fierce exchanges at Hacksaw Ridge are given their due, Gibson is on equally solid ground during the sequences set in Doss’s home town of Lynchburg, Virginia, and at Fort Jackson, imbuing the Lynchburg scenes with a rosy, yet melancholy feeling, and then beginning to make things seem a little darker at Fort Jackson. By the time Doss reaches Okinawa, the viewer is left in no doubt that what follows will make Doss’s childhood trauma and boot camp humiliations seem like a walk in the park. It’s a slow build up as well, allowing the audience to get better acquainted with the men who’ll go into battle with Doss (and maybe not return), and to fully understand the dynamic between Doss and his father, and the bond between Doss and his fiancée, Dorothy. Tales of heroism are often about the act or acts themselves, but here it’s “Doss the coward” (as he’s referred to) who is the focus. His determination, and over-riding desire to save life while everyone else is taking it, is embodied by Garfield’s praiseworthy performance, and further endorsed by the movie’s gung-ho, populist rhetoric. If it strays a little too close to feeling like a soap opera at times (especially in its scenes at Lynchburg), or unintentional melodrama, then Gibson is astute enough to bring it back from the brink. 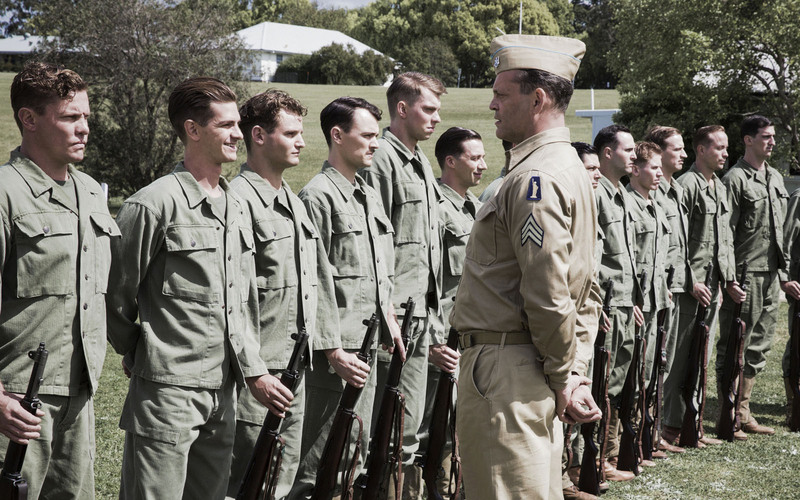 All of which makes Hacksaw Ridge one of the most “authentic-looking” war movies ever made, as well as being a fine tribute to the exploits of a man whose beliefs are truly inspirational. 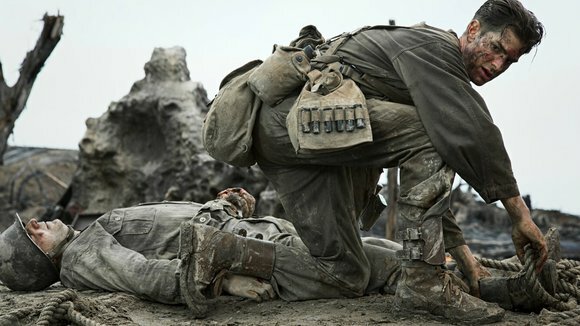 Rating: 8/10 – bolstered by Simon Duggan’s bold cinematography, and Barry Robison’s exemplary production design, Hacksaw Ridge sees Gibson the director on fine form, and making one of the most impressive war movies of recent years; harrowing, visceral, and yet uplifting at the same time, the battle sequences are the movie’s main draw, though the earlier scenes contain enough emotional clout as well to balance things out, all of which provides viewers with one of the most fearless and potent true stories of 2016.